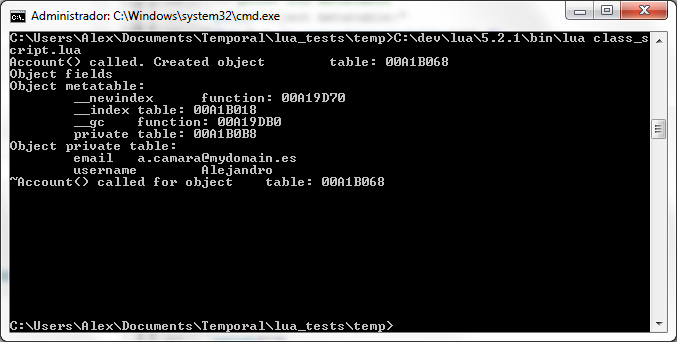 Welcome to the fifth part of these tutorials about embedding Lua 5.2 into a C++ host program. If you have not yet, you may want to read my previous notes on Running Lua 5.2 scripts from C++, Passing variables from Lua 5.2 to C++, Calling C++ functions from Lua 5.2, or Creating a Lua 5.2 dynamic link library of C functions. This time we are going to cover the first steps towards the final goal of these notes — passing objects between Lua 5.2 and C++. In this tutorial we are going to implement the equivalent to a C++ class in Lua, instantiate some objects of that class, and play with them. Notice that Lua does not support classes as it is, so we have to extend Lua to support these structures. We will be paying much attention to the Lua 5.2 Reference Manual and some Lua-Users Sample Code, though this implementation of classes is entirely new from scratch, and thus, probably wrong. Be warned! print"ERROR: objects of class Account do not accept new fields." -- print its public elements (none) print"Object fields"
It has two private fields, username and email, that are weakly encapsulated. It has seven methods, a pair of getter/setter for each of its fields, a constructor/destructor pair, and a method called when a new field is to be created. The “__index” field with value an external table that contains all the methods of the class. When something tries to access a field that is not present in the object table, Lua will look for it in this methods table. Notice that the methods have always “self” as first argument. That enables the use of a:method() for calling the function as it were the object method. The “__newindex” field with value an external function that only prints an error. When something tries to create a new field in the object table, this function will take care of it. Since we only print a message, no new fields can be created on the object table — at least following the usual way. The “__gc” field with value an external function that manages the destruction of the object. When no references are kept for the object table, the garbarge collector will dispose the object. But first, if the user has specified so, will call the function stored in the “__gc” field of its metatable. In our case this just prints some information. The “private” field with value an empty table. Here will be stored the private values of the class. As commented previously, these values are difficult to access, thus providing a hint to the programmer about its scope and, hopefully, making him/her realize he/she is no supposed to be accessing them but with its getters and setters. The constructor then sets the metatable of our object table, sets the object private fields using the class methods, and returns the local copy of the object. In Lua you will have the newly created object stored in the variable ‘a’. We have established the foundation for the next tutorial. Though the classes discussed in this tutorial are quite primitive — no real encapsulation, no discussion about inheritance — they will serve to illustrate some concepts that will be used when passing C++ objects to Lua in a way that Lua can interact with them. So stay tuned for the next episode of these homemade tutorials about Lua 5.2!